Over the last year, we’ve covered a number of events and publications that breakdown the barrier between comics creators and their readership. This reflects a movement within the comics community aimed at inviting people of all ages behind the scenes to see how the magic is made and who the wizards behind the craft really are. In doing so, they hope to open up the medium to new audiences as well as new ideas. This Saturday 14th April, Ireland’s real capital will be contributing to this movement with the Cork Comic Expo. Inclusiveness and openness is at the heart of what makes Cork Comic Expo important. Its success is founded on accessibility. Comics biggest problem is getting books into the hands of new readers, both young and old. Sliney and Co. offer an event that is free to the public and takes place in one of the largest shopping centres in Ireland: Mahon Point. In this way, they bring comics directly to the people. They create an incredibly inviting atmosphere by running free art classes, competitions, and workshops. accessible by its nature. The result is a family day out more than your average convention. Add to an event of this scale taking place outside of the capital and suddenly, you realise you can’t help but come to one conclusion: this is comics as outreach. 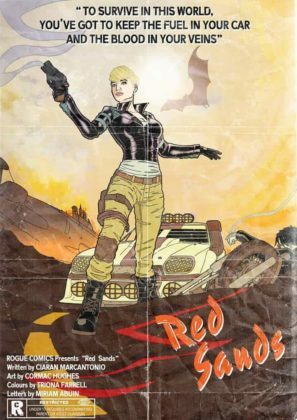 Along with the various workshops and competitions, Cork Comic Expo sees a number of books launching at the event from big releases like Stephen Mooney’s Half Past Danger 2:Dead to Reichs to more small-press affair with Frankie’s Big Book of Assassinations from the team of Paul Carroll and Gareth Luby. One features the pulpy WWII adventures of the world’s greatest chancer and the other the misadventures of the world’s deadliest feline fatale. Both very different books, but they represent the breadth of styles and sensibilities on display within the Irish comics community. It is that shared passion for the medium that fuels their creation. The same can be said for Word Down South, the latest anthology from the Cork Comic Creators group which also launches at the event. It further shows the dedication of creators on the grassroots level. Cork Comic Expo invokes the spirit of Thought Bubble in that it sees comics as an end of themselves rather than a means for producing other media. This is a celebration of comics as a storytelling medium first and foremost. People may be drawn in by the movies and TV spin-offs, but this is an event that seeks to prove to the masses the value of comics themselves. Superheroes may be the medium’s bread and butter, but there is so much more to see and the plurality of voices on display at the event demonstrate that. Moreover, it showcases people at various stages of their career and in doing so, tells attendees that they can do it too. There is no barrier to entry in comics. Cork Comic Expo’s focus on the comics and the people producing them signals to those who dare to dream that this is a journey they can embark upon, if they are just willing to take the first step. The fact that everyone at the event is willing to help aspiring creators on that path is a credit to the sense of community that Irish comic scene has become famous for. Events like Cork Comic Expo democractise the medium. Lot of talk and headline space is given to the discussion of larger conventions/events, where the latest news from the Hall “H”s of the world will be broadcast to the masses. Yet it is local events like this where comics truly live, where they have the most impact. This is where the never-ending cycle of fan becoming creator and inspiring others rejuvenates itself. They allow the pulse of the community to be properly taken. Perhaps most importantly, the provide a forum for a unified voice that lets one simple message be heard by all those who would hear it: comics are for everyone. Check out our slideshow featuring some of the creators and comics on display this weekend at Cork Comic Expo.